Designed to remove mud from barrel washer and presoak tanks, therefore extending the usage time of the water. Two heavy duty chains connected by 'scraper' bars slowly pull soil sediment from the base of the water tank. 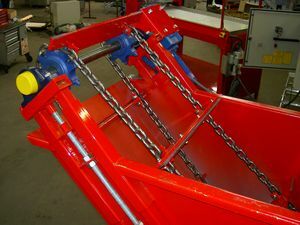 Sediment is discharged by the scraper chain into a waste skip. System is simple, has low maintenance, and is very effective.